c.1982/1983? | age 14/15? Today’s page was drawn at two different times, in biro, and then later in black marker. I’ll talk a bit about actor Denis Lawson (as Wedge Antilles) but also the unfortunate Jek Tono Porkins character (by William Hootkins). Porkins was probably hoping for a suicide mission. As you all know, Wedge was played by Denis Lawson—Ewan McGreggor’s uncle! I was going to say ‘well you wouldn’t think so, looking at today’s page.’ But actually, I just found this photo of Lawson, and it’s not a bad likeness at all! I must say, it must be brilliant being Scottish. I lived there from the age of 4 to 9, and I loved the place. And guess what? Lawson is actually from Perthshire—where I once lived. So while I lived in Scone, near the town of Perth (up until mid-1977), he was probably shooting Star Wars! A film which, at that point, I’d yet to hear of. I wonder if, unbeknownst to 8 or 9 year me, the Perthshire news media were going on about their local boy making it big in Hollywood? Incredible to think that he turned down the opportunity to reprise his role as Wedge in ‘The Force Awakens’. He probably could have demanded a very nice fee. Quietly hoping for a suicide mission? But what about Porkins? Why, oh why did George choose that name for him? There were no black actors in Star Wars—a fact that was lost on me because there weren’t any black people in Ireland in the ’70s either (it seems) apart from the Thin Lizzy singer and bassist Phil Lynott, and I’d never even heard of him at such a young age. So, not one black person, but there was one portly man in Star Wars. In the mid-seventies he was probably still part of a minority. And what happens? He gets a joke name. Poor sod. Incidentally, the late William Hootkins, the actor who played him, was a terrific character actor. He even helped to make Superman IV a better experience! Quite an accomplishment. 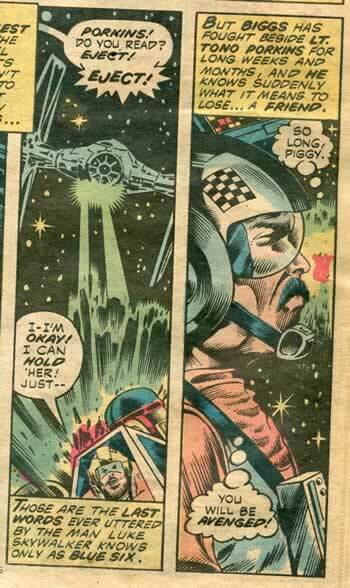 Bad enough to be named Porkins and nicknamed ‘Porky’, but MARVEL goes one better with ‘Piggy’. Funnily enough, in my version Jek Porkins is looking quite slim isn’t he? Wedge is also flying a Y-Wing. What a confused young boy I was. I was about 15 or 16 so it was probably hormonal. 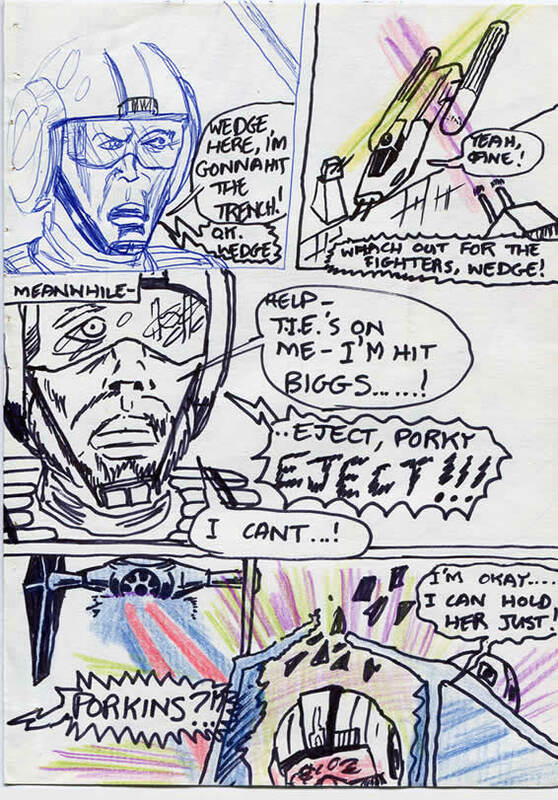 The last panel is just like Howard Chaykin’s Marvel version of SWa9. Not content to call him Porkins or Porky, Biggs even affectionately knows him as Piggy. I reckon that, after the life he’d endured, Porkins’ death above the Death Star was probably a sweet release. Interestingly, you’ll find that in Lucas’ second draft of the ‘Adventures of Luke Starkiller’, Jek Porkins was originally called Phatso McLardyarse. As an aside, Luke was originally called Whinee O’Blandboy. In other news, nice Y-wing. Interesting perspective too. It’s a kind of 3/4 Y-Front. I know. We won’t be appreciated until after we’re dead – in a garret – of Absynthe poisoning – with an ear in one hand and a ‘Star Wars weekly comic’ in the other. That’s good Tom. So I’ll have left something of worth – to someone. I had high hopes for a logo redesign I’ve been working on – but today, the client has rejected it for a botched compromise version. Another piece of crap that won’t go into my portfolio. Hurrah! Oh God I Lol’d at the caption! Porkins welcoming death with open arms? Funny – looking at this site again, it’s pretty good. I don’t think I’ll ever equal it.